Knowing what's on your child's phone or tablet is an important step to keeping them safe as they head back to school this year. 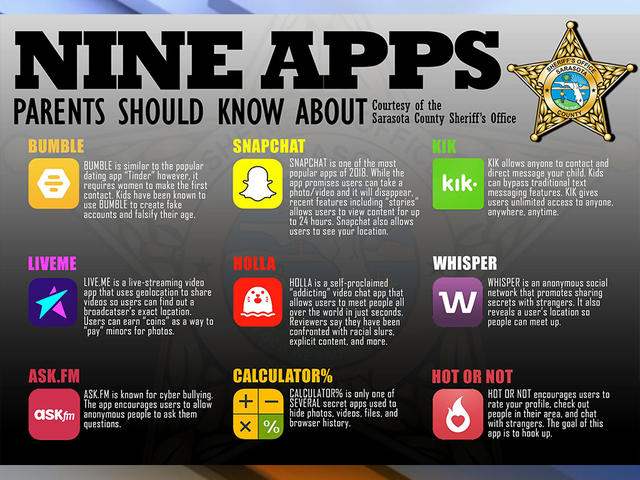 The Sarasota County Sheriff's Office recently compiled a list of digital apps that local law enforcement officers say can be especially troublesome. Maybe you've heard of some these apps -- like the popular Snapchat app -- but others are less well-known. Some tricky apps are designed to hide pictures, and sometimes cyber bullying, from parents. Other apps are exploited by predators to anonymously communicate with unsuspecting kids. What's more, new apps are being developed all the time. 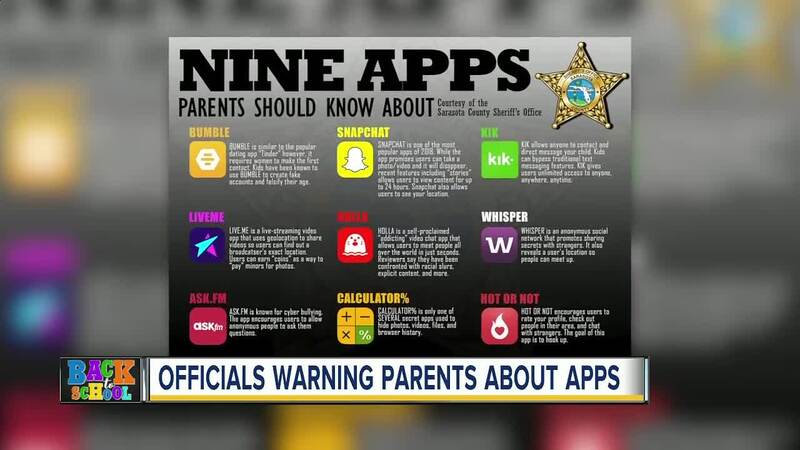 It's up to parents to know what apps are on their kid's phones, ask kids about what apps their classmates are using, and research apps you might be unfamiliar with. - BUMBLE : similar to Tinder, but requires women to make the first contact. Kids have been known to use the app to create fake accounts and falsify their age. - SNAPCHAT : allows users to see your exact location, and disappears content within 24 hours. - KIK : Kids use to bypass traditional text features, but it allows anyone to contact and directly message children on the app. - WHISPER : the anonymous social network that promotes sharing secrets with strangers, and reveals user's location. - HOLLA : self-proclaimed "addicting" video chat app prone to sharing explicit content. - LIVEME : live-streaming video app that tells others the user's exact location. Also has a "coin" currency as a way to "pay" minors for photos. - ASK.FM : known for cyberbullying, app encourages users to allow anonymous people to ask them private questions. - CALCULATOR% : one of many 'secret' apps that looks like a boring app, but is secretly a place to hide photos, videos, files and browser history. - HOT OR NOT : popular 'hook-up' app that encourages users in your to rate your profile. The company TeenSafe has a blog post with other new apps that teens are known to use.